Let the SQLSaturdays for 2014 Begin! 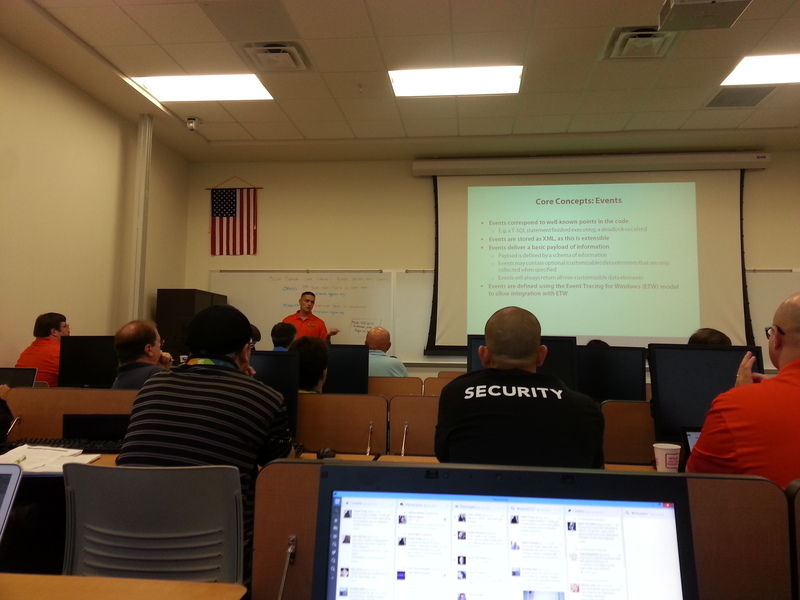 After my normal holiday hiatus from speaking, nice to get out to some early SQLSaturdays to begin this year. First up was Nashville. The Nashville event is great for so many reasons but it holds an ooey gooey sentimental spot in my heart. Nashville was where I gave my first presentation at a SQLSaturday. It was also being led by my dear friend/sqlfamily, Tamera Clark (twitter|blog) so I just HAD to go. It was about 5 hours from me so I drove down on Wednesday. Went down little early to do some work on a project. My BlueGranite colleague, Josh Fennessy, (twitter|blog) was also speaking so took opportunity to work with real live person, in person! 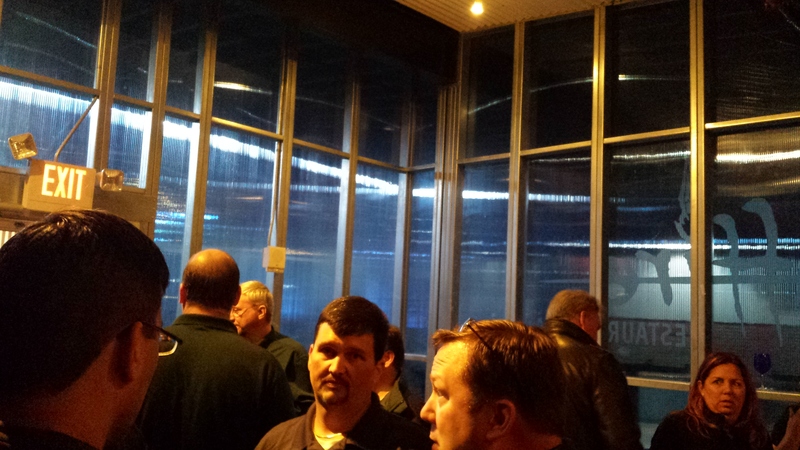 SQLSaturday events began with the speaker dinner was at a very funky place called Saffire. It was in an interesting old factory. Good food, good beer, and plenty of catch up time. Event day comes early to setup the booth for BlueGranite. So extremely proud that my company helps to support these events! 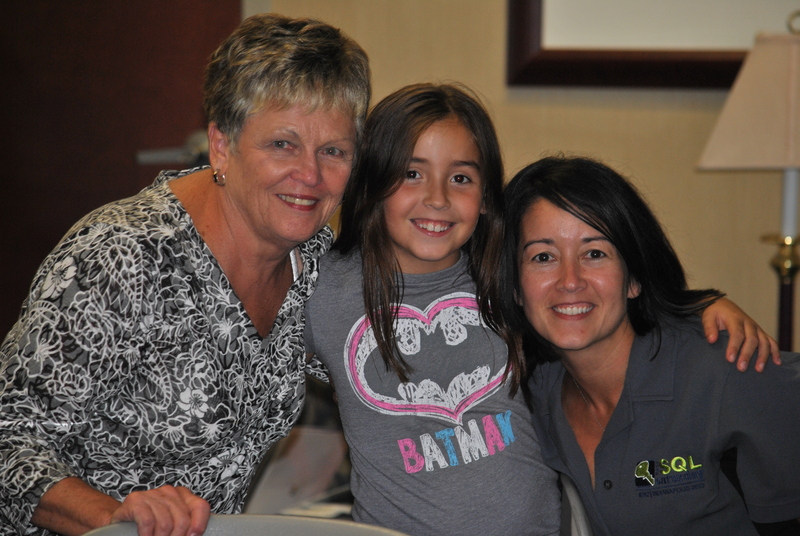 We meet great people all over for both opportunities but especially for recruiting. I know the last 4+ people hired at least seem to have been plucked from the SQL Server community. Just a fantastic thing! We just have no fun at these events. After time chatting up folks at the BlueGranite booth I head to the WIT panel discussion. Wendy Pastrick (twitter|blog) was the moderator. The super lovely panel included Arlene Gray (twitter|LinkedIn), Rie Irish (twitter), Julie Smith (twitter|blog), and myself. It was a nice refreshing discussion that had very little to do with gender. The topic was just in general how to keep the young whipper snappers going into IT positions. One of my favorite points was made by David Maxwell (twitter|blog). He expressed that folks in IT like to complain and rant. It’s how we bond and let off steam which is fine. We should also be aware though if we always are stressing the negative. We like our jobs and it drives a lot of passion in us. We need to make sure, especially with young ones, not to let the complaints always take over the conversation. After that was my session on SQL Server server performance. It went pretty well. I got some great ideas to tweak that presentation from Rob (twitter|blog) and Julie. Thanks guys! 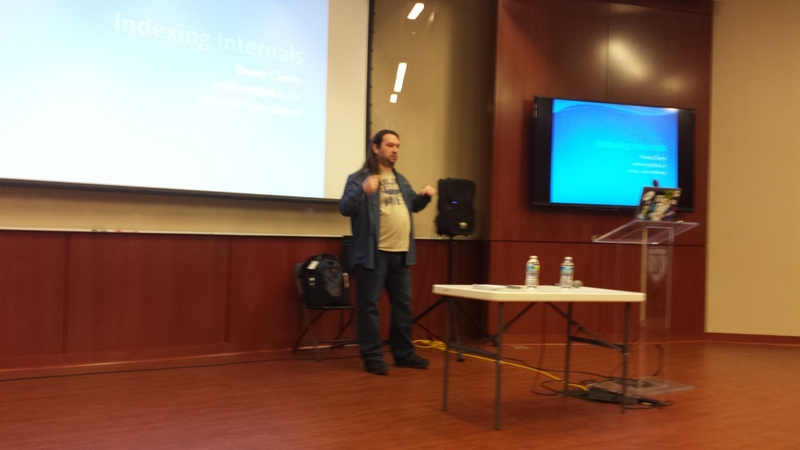 After my session I was able to catch Denny Cherry’s (twitter|blog) presentation on indexing internals. He’s on the west coast so not very often outside of Summit that I am able to catch him speak so was excited about that. Excellent stuff! People streaming in for the prize drawings to wrap up Nashville. Up next was Cleveland this past weekend. I missed Cleveland last year and pretty much made up my mind then and there that I would not miss it this year. As I was submitting, started looking at the schedule and then began to have a bit of organizer envy. It was really a phenomenal line up and was honored to be a part of it. So Friday I get some work done in the morning and then drive over in time to make it to the speaker dinner. The dinner was at an Italian restaurant and they had a nice sit down meal. 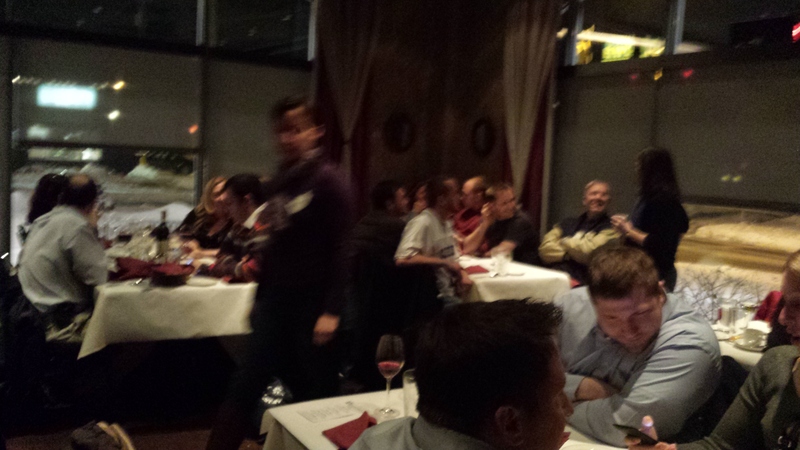 Blurry but here is speaker dinner in Cleveland. Saturday began again very early to setup the BlueGranite booth. Again very proud for being a sponsor for this event and for such a strong presence of speakers. Cory Stephenson (twitter|LinkedIn) also helped organize the event. I spent most of the day at the booth having great conversations. The booth had a nice spot right next to the curly slide. Yes I said slide, no typo there. 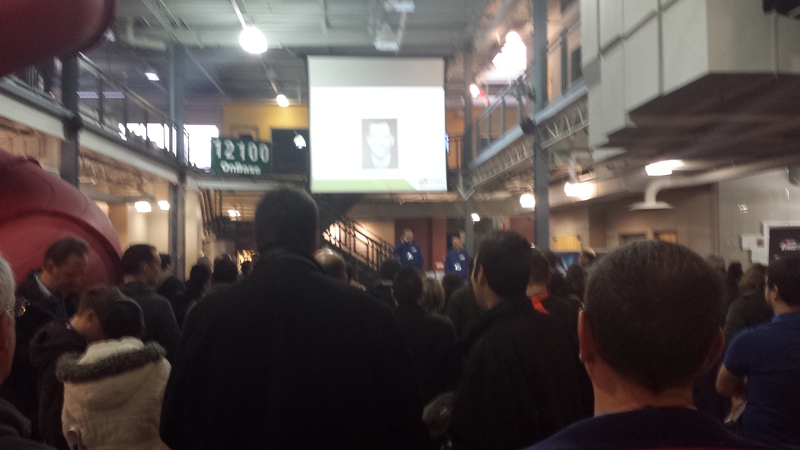 Hyland Software’s building had a couple slides…how cool is that?! View from the booth next to the slide. 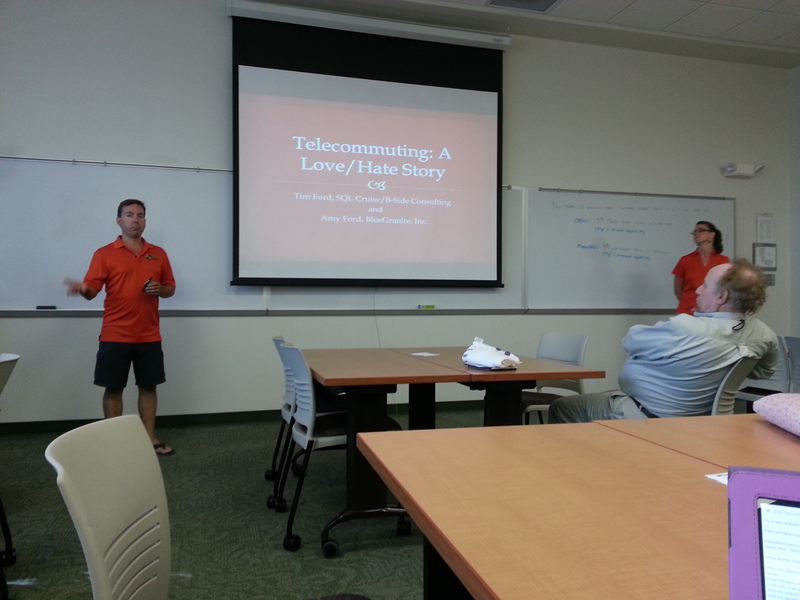 My presentation was in the afternoon and it went pretty well. 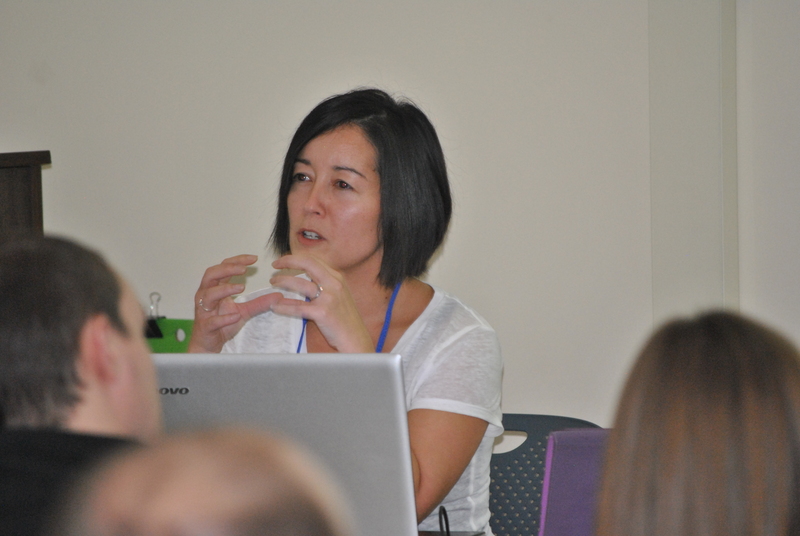 I gave my most favorite session…spatial data. The conversation during that session gave me a lot of great ideas for making some tweaks to it. Thank you very much to those who came and gave feedback. Check out my favorite feedback from David Maxwell’s 11 year old daughter below. What could the speaker do differently to improve? – I saw some confused faces in the crowd. Check to make sure everybody is on the same page before you move on to the next bit of your presentation. 11 years old! And excellent advice! David make sure when she enters the workforce that she sends me her resume! Also really wonderful you took her to a SQLSaturday as well. I hope she enjoyed it! I am hoping to take my daughter to one this summer as well. Love seeing the little ladies being exposed to great people in the technical field. The after party was at Dave and Busters. It was nice to sit and relax after a long day. Had some very interesting conversation with sqlfamily that included zombies and tilapia (don’t ask). After that was some Cards Against Humanity. The next morning catch some breakfast with some SQL Family before heading back home. The snow overnight made the journey back a little stressful. The roads were really horrendous through most of Ohio. Just another hit from the winter without end. I still would do it again. Both events were top notch and thank you for having me. 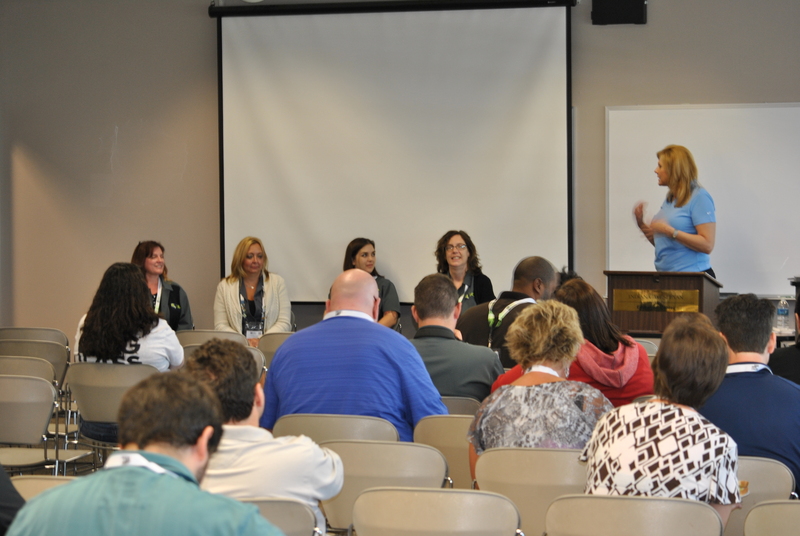 Will be taking some ideas back for the next SQLSaturday in Indy (shameless plug pointer to website here). 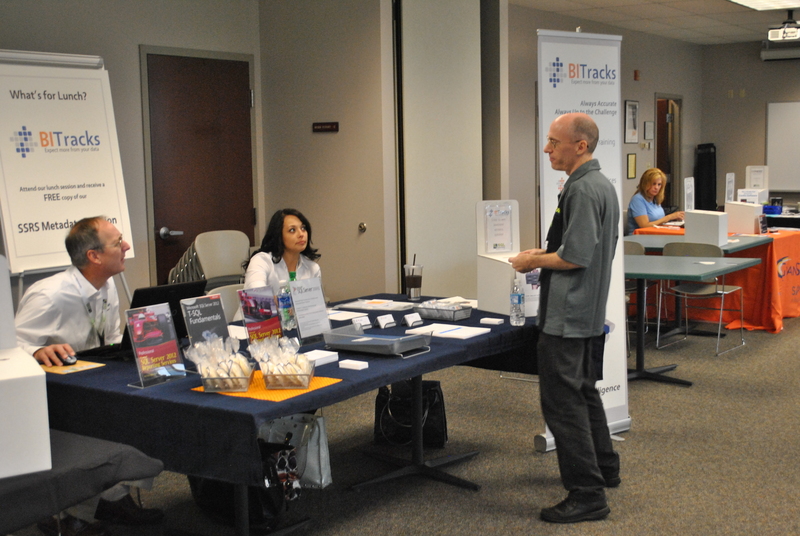 Last weekend was SQLSaturday Kalamazoo. This lovely little SQLSaturday has worked it’s way onto my regular yearly list. It’s a short little drive from me in Indy and the people involved are wonderful! Didn’t need more reasons but is also now home base for my company, BlueGranite. Stormy weather ended up delaying my departure up there on Friday. Trick or treating was postponed on Thursday to Friday for the first time that I can remember. My kids are 8 and 5 so there is no way I was going to miss trick or treating so I missed the speaker dinner. It was at a brewery that I’ve never been to so was sad to miss it. I had a good time running around the neighborhood with Wolverine and a ninja though. So we get to Kalamazoo around 11:00 pm. 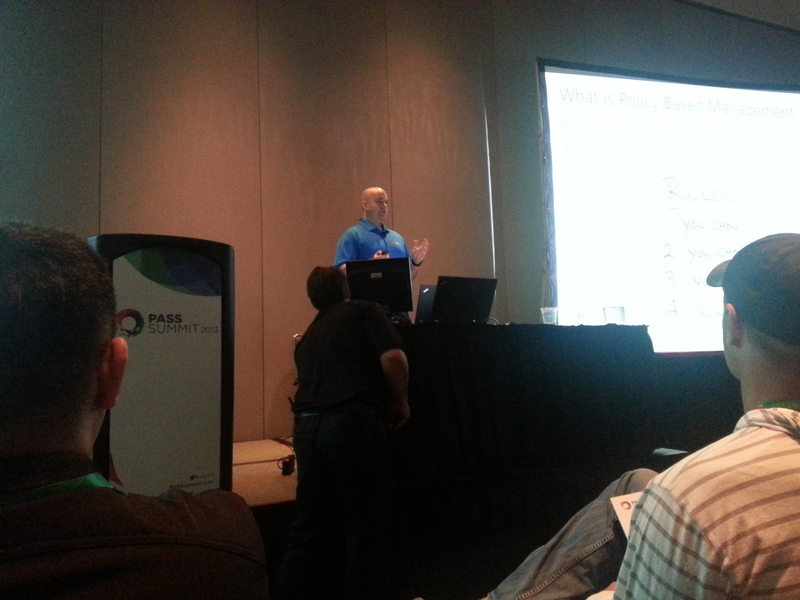 My husband, Rod, went with me again in further efforts to get him hooked on SQLFamily (insert evil mwa-haha laugh). Get up and get a quick workout before heading over to the venue. My session wasn’t until after lunch which is a pretty nice slot to have, late enough to get settled and time to run through demos but not super late. I am normally distracted with my own session until it’s over so stinks a bit as I don’t normally attend sessions before mine. They had an amazing lineup so was a little bummed to miss so many great presentations. 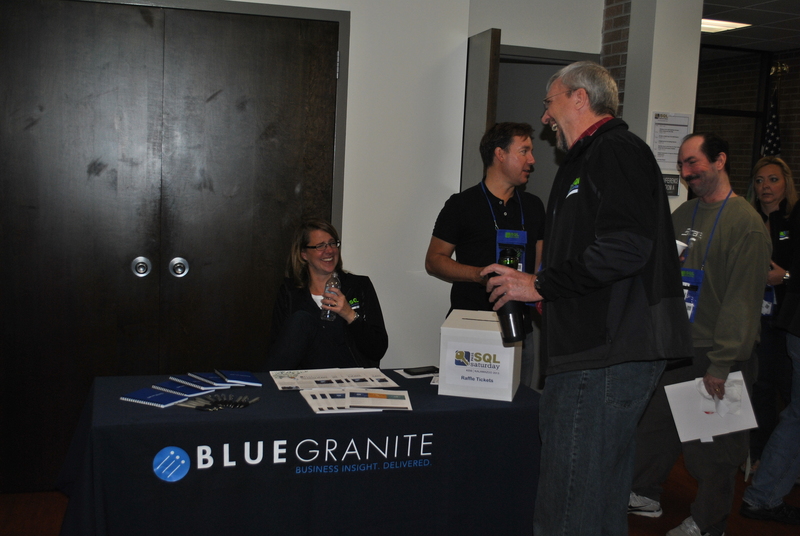 It gave me time to chat with many of the folks from BlueGranite though. 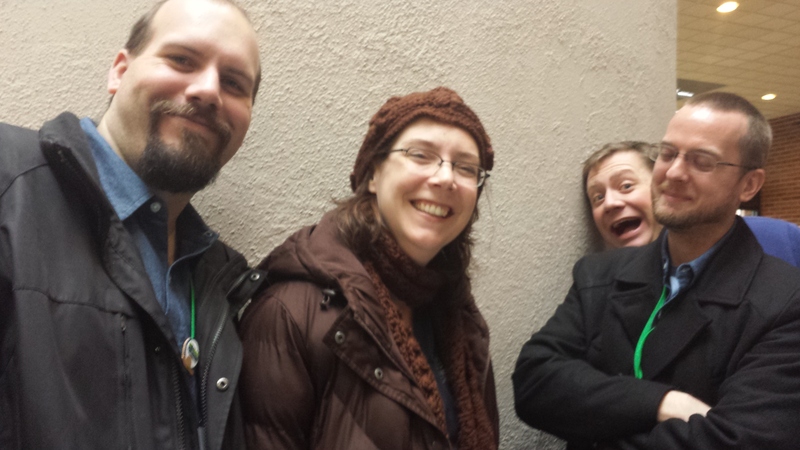 We had 4 speakers represented and then Josh (twitter|blog) and Amy (twitter) organizing! We were also a sponsor so got to meet Mike Depoian (linkedin), VP of sales as he assisted at our booth. Being a completely remote company, was a great opportunity to put faces to Lync avatars. Ok demo, you are working now. Please work later! My session came after a nice taco bar lunch. I am so jealous of those who have venues that allow outside caterers. I just love the taco setup for a big group like that and is nice change of pace. So nice and stuffed in a super hot room….zzzz! No it turned out well even though I was a little nervous with this one as I hadn’t done it for several months. I was more worried that I was on a new laptop. I had only had the new machine for a few days and had installed the latest bits for everything I could. Little nerve wracking but it gave me an opportunity to get folks info on some new performance counters for SQL Server 2014 which was great. Everything seemed to go well and I got wonderful feedback. Thank you for everyone who came to my session and especially those who gave feedback! Talking about performance counters or describing a cheeseburger? Then gave big sigh and decompressed a bit. Ended up only in the last session of the day for Michael Swart’s (twitter|blog) session “5 Easy Pieces”. I love hearing of people’s experiences, soaking up others wisdom. He is another one of those lovely polite Canadians and had some great stories to tell. I especially loved the one on indexed views. He had a situation where the difference of edition to standard threw off performance in relation to an indexed view. He had to use WITH (NOEXPAND) to resolve it. Great session Michael! I enjoyed it very much. After giveaways most of the speakers went over to The Mix. I was a little nervous as it was a bit of a young pup bar on college campus but it turned out really fun. Josh and team had setup a KJ to perform, yes karaoke. The KJ was a good one and won me over with a rendition of Run DMC’s “Tricky”. I think I am going to go with the angle that I didn’t karaoke that night. I don’t think that which may be construed as me doing karaoke counts. Can I keep my record? 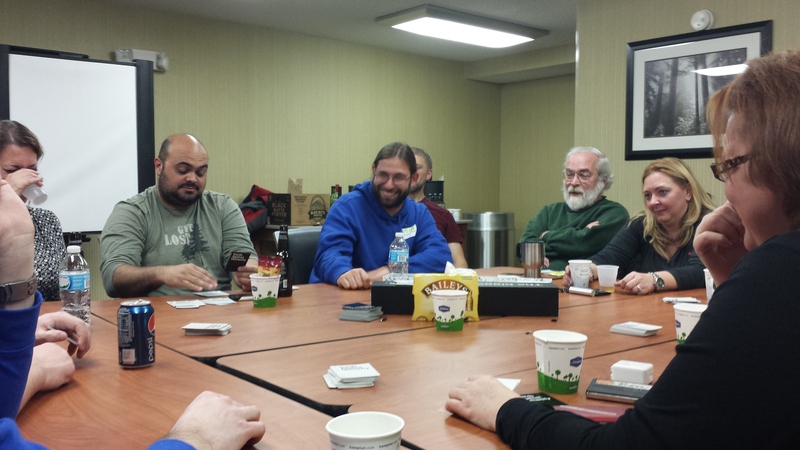 After The Mix we head back to one of the hotels for hanging out and some Cards Against Humanity. The end to a really great weekend was made even better due to the graciousness of those fine Ford folks. Tim (twitter|blog) and Amy hosted a really nice brunch for everyone at their house. Thank you both so much for that! It really ended the weekend perfectly! The event was flawless from my point of view and got a nicely timed post Summit SQLFamily fix! Oh and we got great jackets! I didn’t think they could top the nice jackets from last year but they did! Check those pictures…they look great! Thanks for having me up to speak and for the super nice jacket! Josh, you guys did a great job! 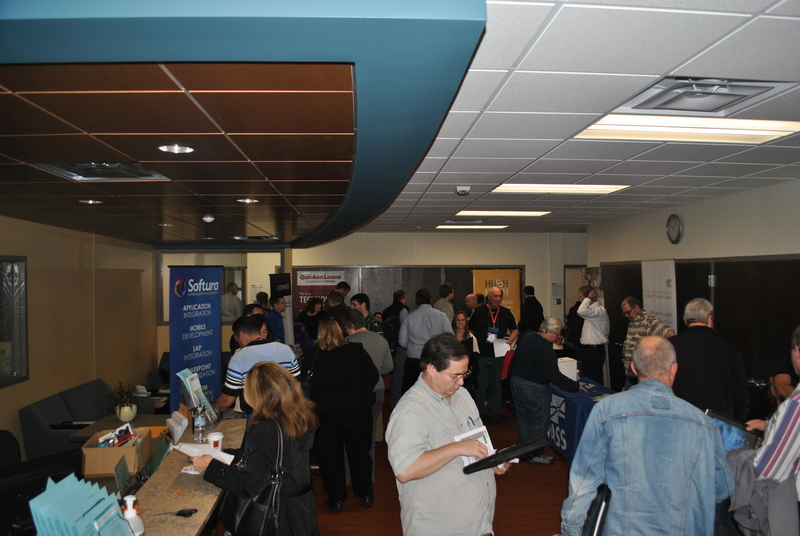 Congrats on a wonderful SQLSaturday! Also thank you to my hubby Rod for taking all the great pictures. If you want to see the full set of them they are uploaded to link below. The beginning of the end day at Summit began and doesn’t take long to start running into people leaving and the good byes begin. It’s so nice catching up with people that you may only see once a year, definitely sad when it’s over. 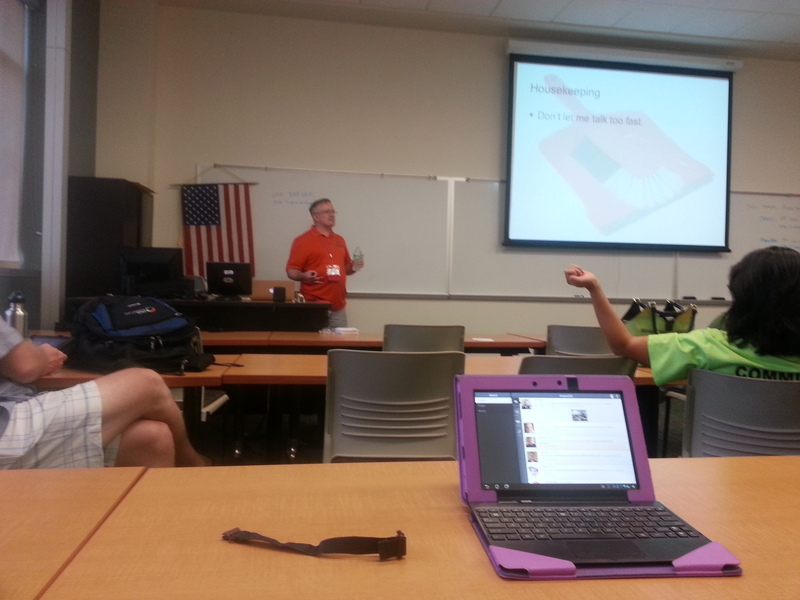 I made it in time to catch Lenny Lobel’s (blog) session on spatial data. He was such a vital role in my learning of spatial data, was very excited to see his session. He concentrates more on the development side so nice seeing some applications involving spatial data. And also one of his queries helped to trigger a potential method to help me with an interesting question I got while in Orlando. After his session I went to the Birds of a Feather luncheon. It’s a lunch where they have tables that contain topics and assign some expert resources to sit at them. It’s a great one and I always have good conversation. I ended up sitting with folks at the replication table. Interesting hearing some experiences with it and some large applications using it. 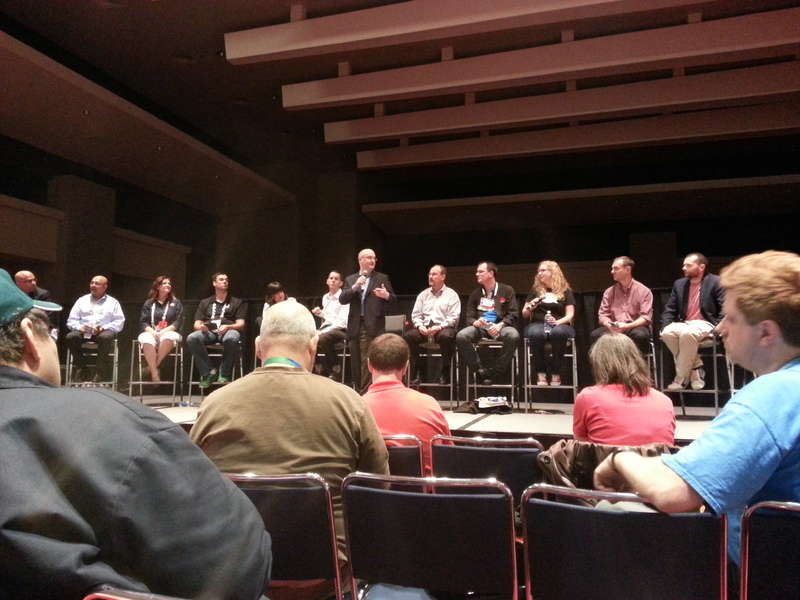 After lunch I made it over for the PASS Board Q&A. It is an opportunity to ask the entire panel of board members questions. If you have any issues or concerns, it’s the one opportunity I know of to get them answered directly. I didn’t have any grievances to air but it normally is good conversation and nice to hear the thinking behind decisions made. It was very interesting to hear outcomes of the BA Conferences since it was a new endeavor. 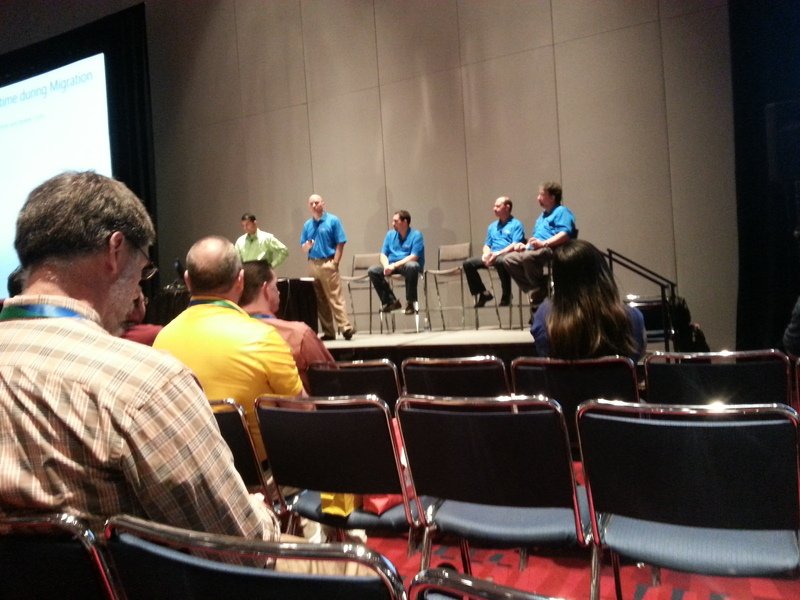 Next I went to a session on Always On that was done by a customer panel. I love hearing people and their experiences! 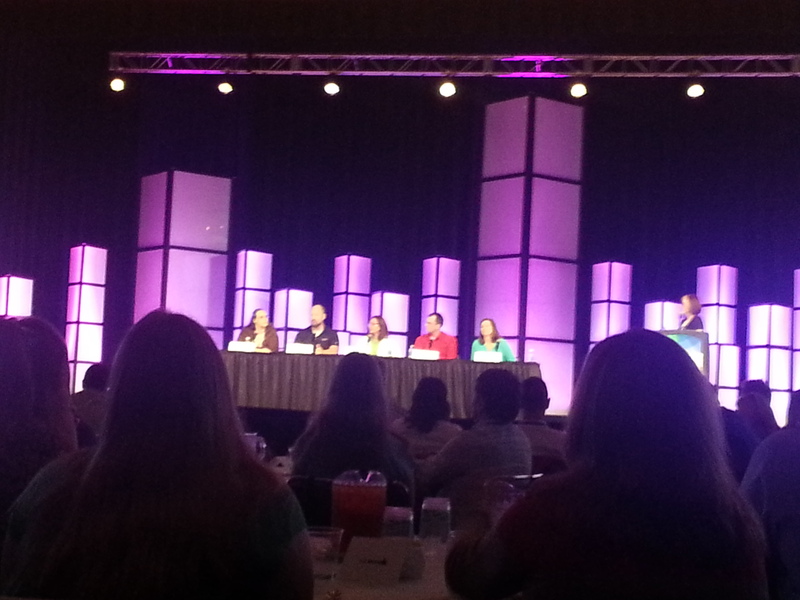 This panel contained people who have some very challenging environments. Enjoyed hearing what they had implemented to assist in those challenges. After that was the last session of the day and Summit. I went to see my friend and colleague at BlueGranite, Josh Fennessy (blog|twitter) and his session on Excel 2013 for analytics. It was an excellent session and I’ve already used some of the material I learned there. Josh always seems so very relaxed in his sessions. I knew he was a little nervous and it was almost sickening how it didn’t show AT ALL. And then it was over! I went over to the community zone again to make sure to say goodbye to as many as I could. I then went with a large group of SQLfamily to a nice dinner at Fleming’s. It was very relaxing to sit down to a great meal where they brought the food to me. After that went to Dillinger’s for one last drink and called it an early night since my flight was fairly early next morning. 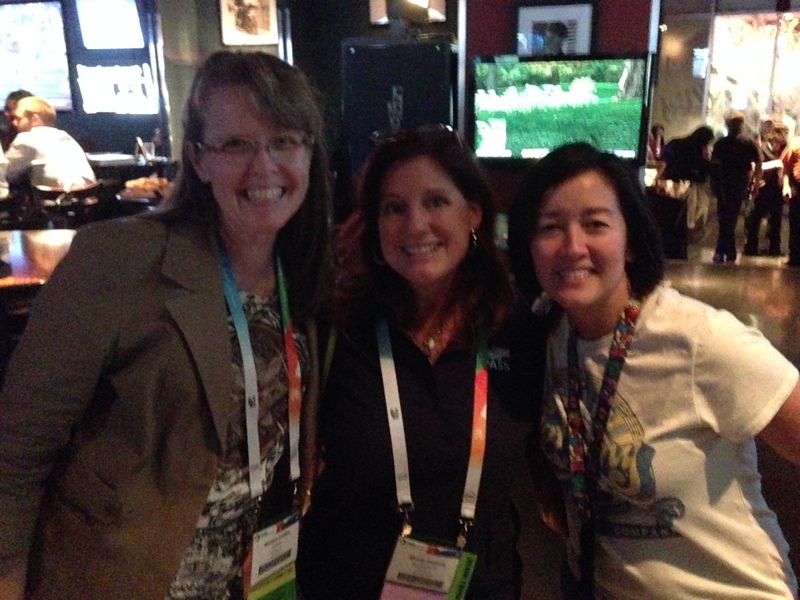 It was so great seeing so many wonderful SQL family members! I have said several times that getting involved in this community has forever changed my life and career! I couldn’t help reflecting on things at Summit since I got to speak this year after trying for so long. I am honored to be considered caliber to speak at this wonderful event! I am so grateful to the extremely long list of people in the community who helped encourage me to get out there and helped stop some of the negative voices in my head. You know the ones saying things like “who wants to hear what you have to say when they have <insert super smart other speaker> out there giving sessions”. I am still just amazed at the good nature of this community and I will keep making sure I do my part to make sure it stays that way. It may have been the nerves at work again but it seemed as soon I opened my eyes I was wide awake. 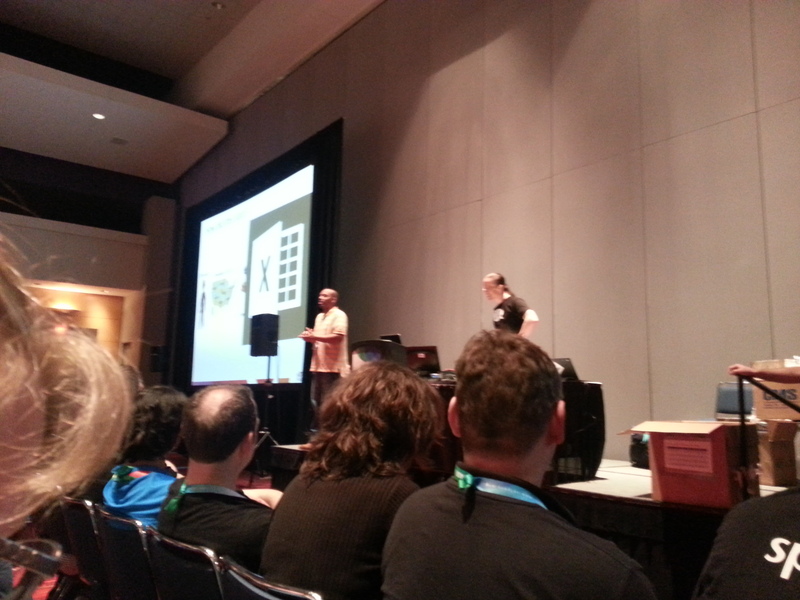 I got up in time to catch a super quick breakfast and get to the opening keynote. It was a fairly tame and without incident keynote. Watching Twitter it seemed the only large flair up was when “ask” was used as a noun. The demos were good but I missed seeing Amir Netz (twitter). I just love his demos! After the keynote I spent the rest of the day chatting with folks and preparing for my session in the afternoon. Had some great conversations at the chapter lunch. For those unfamiliar with this, they have maps and tables setup for the local user groups so you can find groups in your area. I met several people in Indiana that are a bit too far south to make it to IndyPASS. 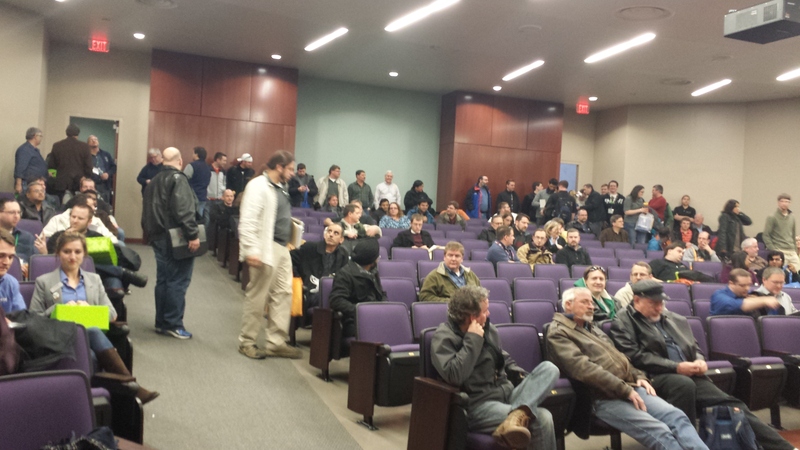 There is some interest in potentially setting up a new user group in Bloomington. If there are any others interested in this please let me know. I would love to help this effort but need to make sure I have enough dedicated people to lead the group. GO TIME! Then comes time for my presentation and my room is very well filled. I am always worried I will be presenting to an empty room but elevated a bit at Summit, especially when I know Bob Ward’s (twitter) is on at the same time. It was true what others kept reminding me, different audiences want different things and a 500 level session isn’t for everyone. I get started and think I did pretty well at hiding my nervousness. I remember at BA Con I could feel/hear the nerves in my voice. I didn’t notice that in this time. It’s one of my favorite sessions with absolutely my favorite demo dataset, a database of microbreweries! I know I can always tell when someone is passionate about the topic they are presenting, I hope that came through with my attendees. 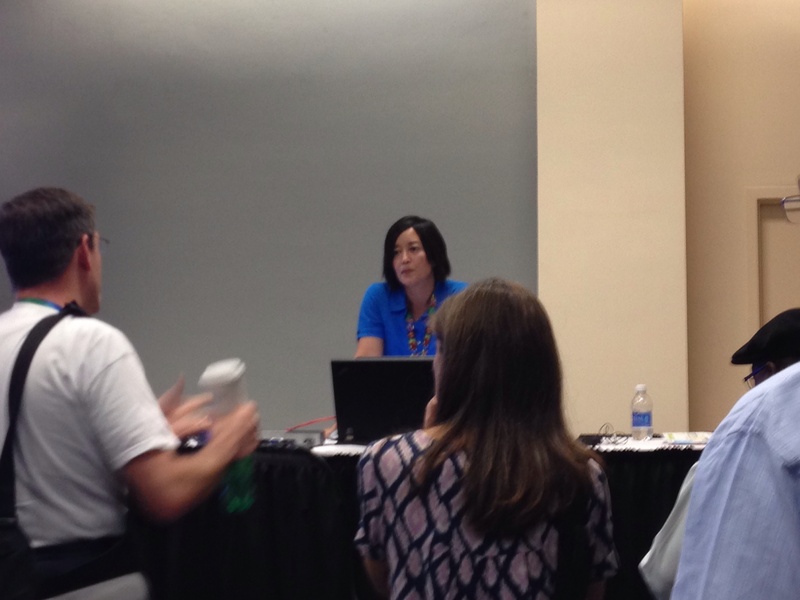 I felt it went pretty well and had several stay and chat and ask questions after my session. I had some very positive feedback afterward which some comments were just so good it just about floored me. It felt so good to be done and it go well! Could just feel the weight come off my shoulders. 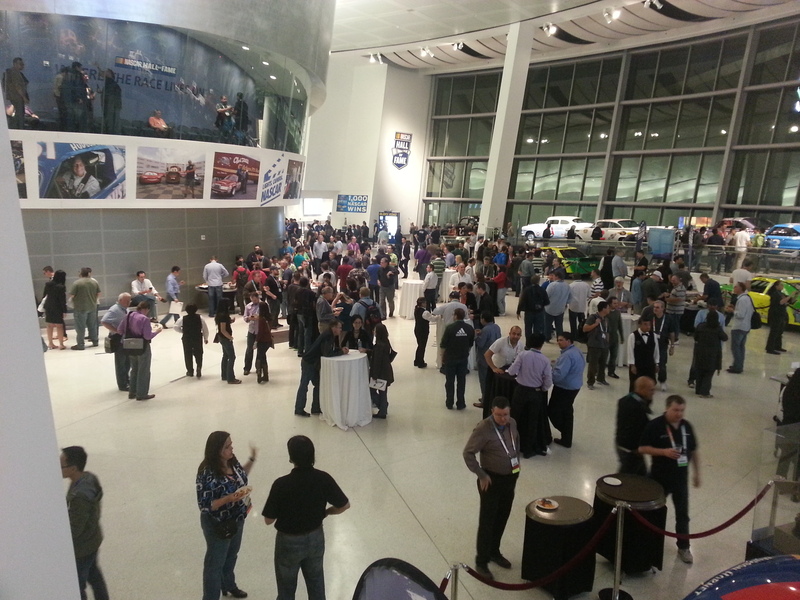 After floating around on cloud 9 for a bit, went to the Exhibitor Reception. This is where they get folks in to talk with sponsors with the enticement of free food and drinks. I made several rounds to make a meal out of the appetizer stations but little easier with hearty items like shrimp and grits. Ended up leaving fairly early to head to Prohibition to get a table for the Pragmatic Works karaoke party. 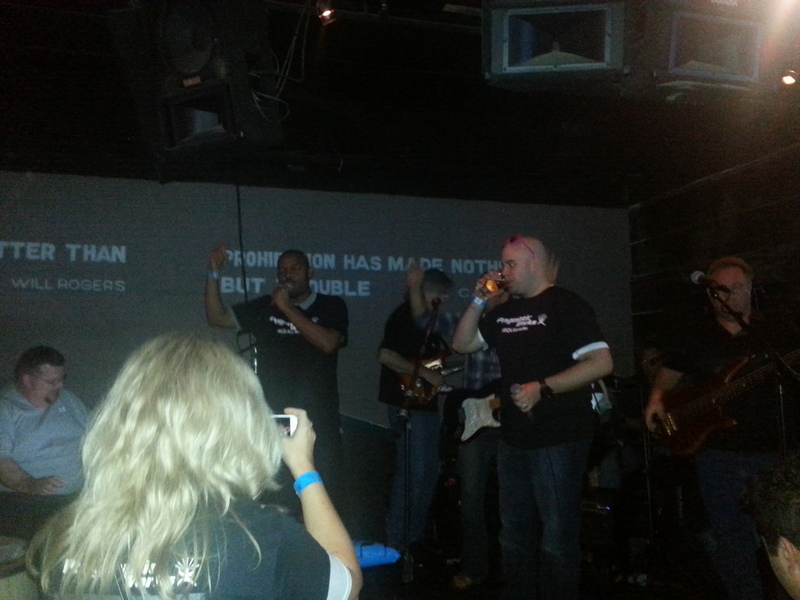 Oh the SQL people and their karaoke! It was a really nice party and some very memorable displays like Colin (twitter|blog) and Patrick (twitter|blog) yearly performance of “Forgot About Dre” and chicken appearances from Jorge/SQLChicken (twitter|blog). From there went to SQLSentry’s party at the Ale House. It also was a very great party and was honored to be invited. The highlight was meeting and talking with Paul White (twitter|blog). I was shocked at how nice, humble, and gracious he was in person. Who doesn’t love that chicken?! I again surprised myself by waking up in time to catch some breakfast, I mean bread before keynote. My list of complaints is small from this year’s Summit, but breakfast this year was disappointing (I know, I know…I like food). Every day was the same very bread laden meal. The only other options to pastries/bagels was oatmeal or yogurt. I know logistics of feeding that many people is tricky but would have been nice for some other options like there has been in previous years. The keynote was Dr. David DeWitt which is always a great one. I was super distracted during it though since was planning to try to take a certification test. They had half price certification testing going on at Summit. Knowing the keynote was going to get deep I ended up leaving early to go try to take 70-465. I was planning on doing the normal course and starting at 70-461 and go on up from there. I’m not sure what possessed me to take this particular test. I had been solely focused on my presentation so went in completely cold, and came out with….a better understanding what I will get into next time. Can’t win them all and I felt better keeping focus on presentation and getting my win there. I made it back just in time to make it to the WIT luncheon. I am involved with the PASS WIT VC program so would have been very upset to miss it. The panel consisted of Erin Stellato (twitter|blog), Rob Farley (twitter|blog), Cindy Gross (twitter|blog), Kevin Kline (twitter|blog), and Gail Shaw (twitter|blog). There was good conversation there but it ended up being initially very lop sided in who was speaking. That worked out better in the second half. And honestly it seemed to be missing some of the fire in belly moments that drove me to be involved in WIT. Erin ended up saving me from missing out totally on that with her exchange with a member of the audience. A woman mentioned a comment being made to her that she had all the traits stacked against her success in IT in that she was an athlete, foreign, and a woman. Erin’s response was that she should have responded with “How am I not going to succeed?”. Thank you Erin for that highlight of WIT luncheon in my opinion! From there I was excited to finally go to my first technical session. I took too long to get to a session over PDW and was denied entry as it was full. Doh! The next session I decided to head over for morale support to Colin’s session on policy based management. He was a first time Summit speaker and was very nervous as well. I hated seeing when I got there that he was having some technical issues with the projector. It was something I had run into before too where you couldn’t see on the laptop and only on the projector. It’s a workable situation but makes it VERY difficult during demos. They ended up getting him a second monitor and it worked out fine. He handled it much better than I would. My face started to flush a bit with speaker sympathy symptoms. Was a great session and I learned about EPM Framework from Lara Rubbelke’s (twitter|blog) team that extends capability of policy based management to SQL Servers across environment that is available on Codeplex. 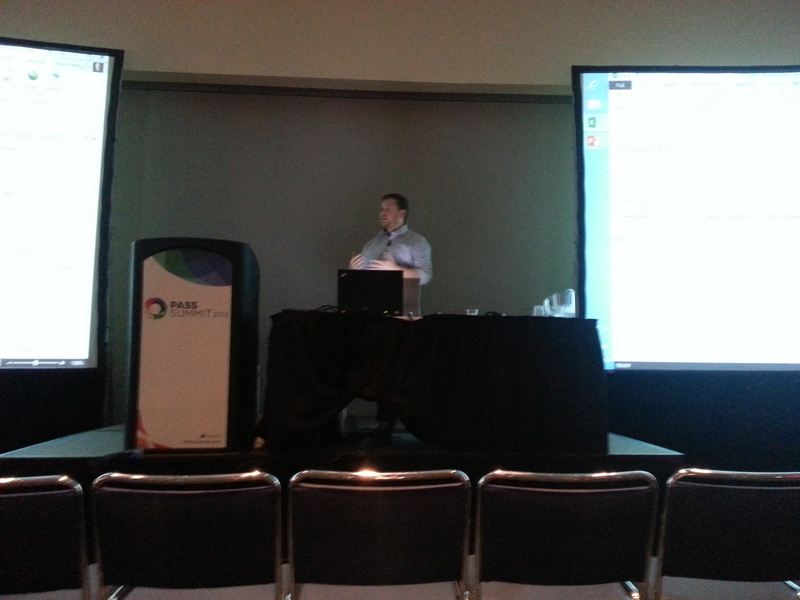 Colin presenting like a boss while tech guy works out issues. Next I made sure to get to the BI Power Hour session. I caught it last year and was one I definitely didn’t want to miss. When I’m figuring out sessions at Summit I always try to think about which sessions will lack full impact on recordings. This is very high in that category. They aren’t moving mountains admittedly with technical content but have a damn good time with the BI tools and is just fun. Did learn that Power Pivot was “just so metal that it caused the split in the name” from Matthew Roche (twitter|blog). Also Matt Masson (twitter|blog) showed how he impressed his kids with business intelligence and how vast his knowledge is of My Little Pony. After catching up with my youngins back home I made it over to the Nascar Hall of Fame for the Community Appreciation Party. This party was good but I am little biased to the party last year at the EMP. I’m not exactly a Nascar fan so the material around at the hall of fame wasn’t getting the oohs and ahhs but that’s just a personal preference thing. Only complaint that I had was the space was a bit smaller so was cramped in some areas. Ah Summit time! The biggest and best time to meet up with SQLfamily. You always get pockets of SQLfamily at SQLSaturdays throughout the year but this is the time when EVERYONE is there for an all out SQLfamily reunion. This year was a little special too…it was my first year going as a speaker! Even on the way to the airport I could feel the difference, I had never left for Summit with presentation anxiety. I had a one hour delay on the way to Charlotte but even then was much less time to get there than Seattle. It was a nice change of pace too to be on the same time zone as home. I get to hotel, drop my stuff in room, and immediately head out to try find people. I was excited to start having those “heey, long time no see” moments. I went over to Buffalo Wild Wings for the very end of the networking party hosted by Andy Warren (blog|twitter) and Steve Jones (blog|twitter). I definitely found plenty of “hey” moments there. You have to give yourself extra time to get anywhere at Summit due to those moments. From there folks decided they wanted to try to do some sqlkaraoke and we walked a few blocks to try to find a place called Dixie’s. We walk up to it and find it was closed, permanently closed so decided to head back go to Carolina Ale House. 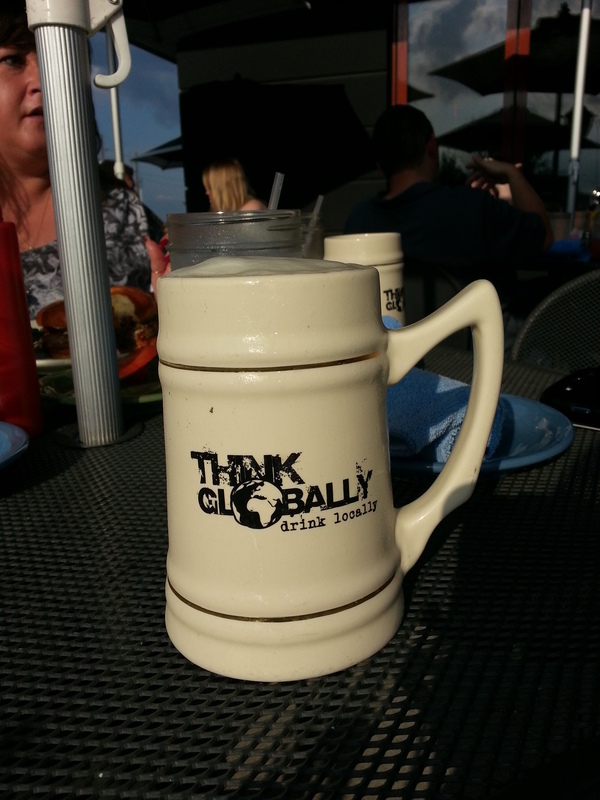 We had amassed a fairly large group by that time and the folks at the Ale House were not prepared, staff-wise. Maybe it was just coincidence in the locations we chose but for being in close proximity to the convention center, places seemed unprepared for such a large conference. Next time the conference moves from Seattle it may help to make some calls into the local establishments for warnings if that wasn’t already done. From there we just ended up having drinks at the hotel bars and hanging out there. Wake up fairly early and head over to grab a crepe with my good friend, Colin Stasiuk (blog|twitter). I then get registered and spend a little more time preparing for presentation. 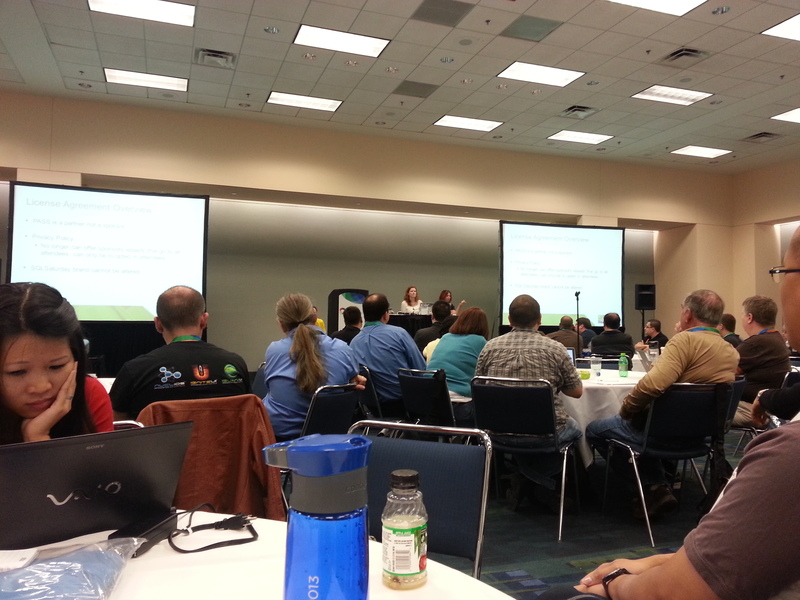 After that I went over for the SQLSaturday organizers meeting. It was a good meeting but it’s always hard to move mountains in meetings that large. There was mention of some changes coming to the website. If anyone has recommendations for changes they are collecting them now. I was also intrigued by a mentoring program that was mentioned for organizers. I have a circle of people I know who organize and I reach out to with questions so have created my own organic circle/support group. I would be afraid there are folks out there floundering without one so seems like a great idea to me. That and I always hated to be constantly bugging Karla (blog|twitter). Amazes me every year the number of First Timers at Summit. After the meeting I went through more prep for my presentation. At this point I was EXTREMELY nervous! Trying for so long to be accepted as a speaker at the Summit, the idea of it not going well just about make me sick to my stomach. Going back and doing a run through and saying the words out loud in my room helped calm the nerves. I did that until it was time to head over to convention center to prepare for the Quiz Bowl at the welcome reception. I was very honored to be asked to participate in it this year by Tim (blog|twitter). So we do some preparation and then head over to get ready to welcome the first timers. Had some good conversations with my group even though I looked ridiculous donning a spinning beany hat. They always try to help folks locate the volunteers and I’m sure someone somewhere had fun with the decision for those hats. 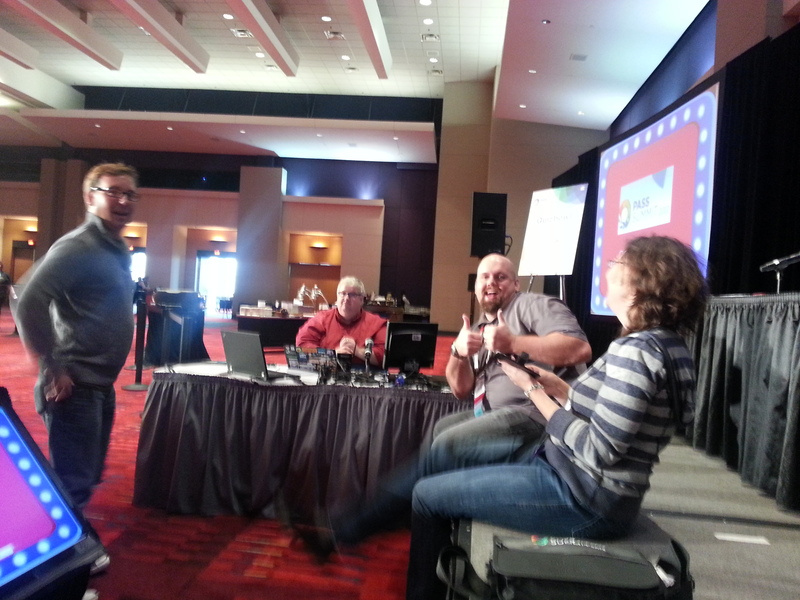 Then it was Quiz Bowl time and we had fun even though we didn’t win for our contestant. Next I went to the volunteer party at Strike City, a bowling alley. After catching up with folks there and a terrible display of bowling I went over to see how things were going at Fox and Hound. 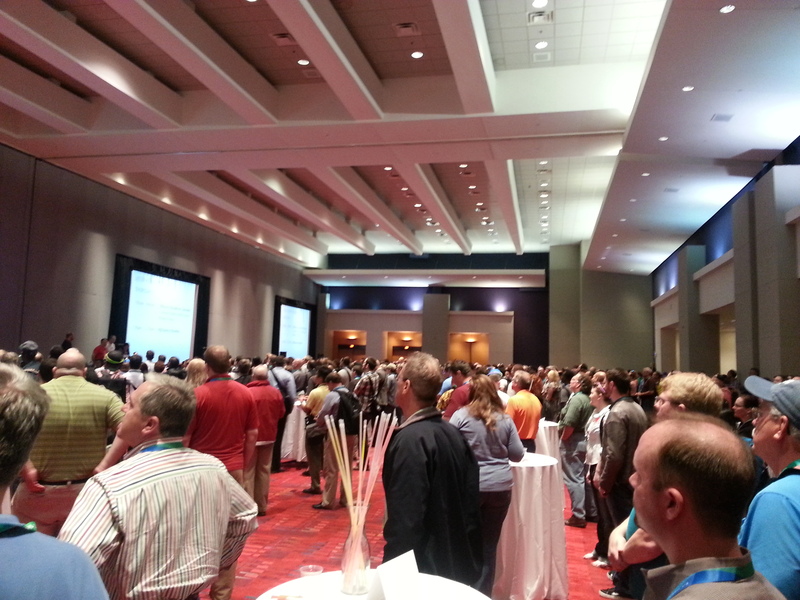 Mr. Denny Cherry (blog|twitter) was hosting a party there sponsored by SQL Sentry and SIOS. 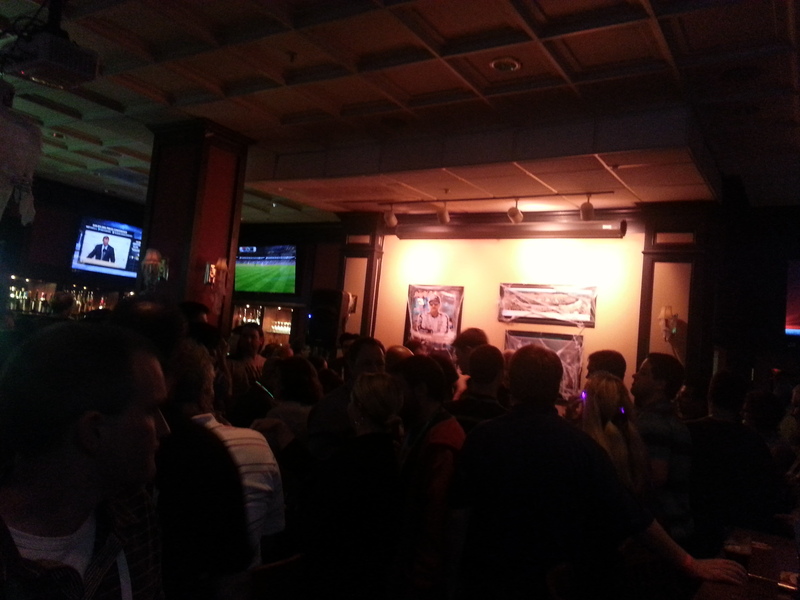 It was packed and had a good time watching folks do karaoke. I set a decent curfew for myself that night so headed back fairly early. No way I wanted to be super tired for my presentation the next day. I was a little later than normal getting this post out since I literally got a new job the day after getting back from SQLSaturday 232 (see post). I didn’t forget you Orlando! 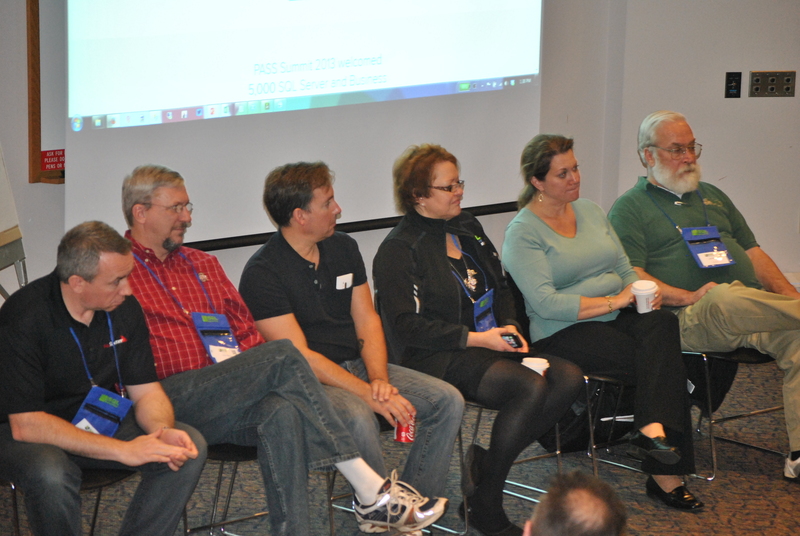 This was an exciting SQLSaturday for me. 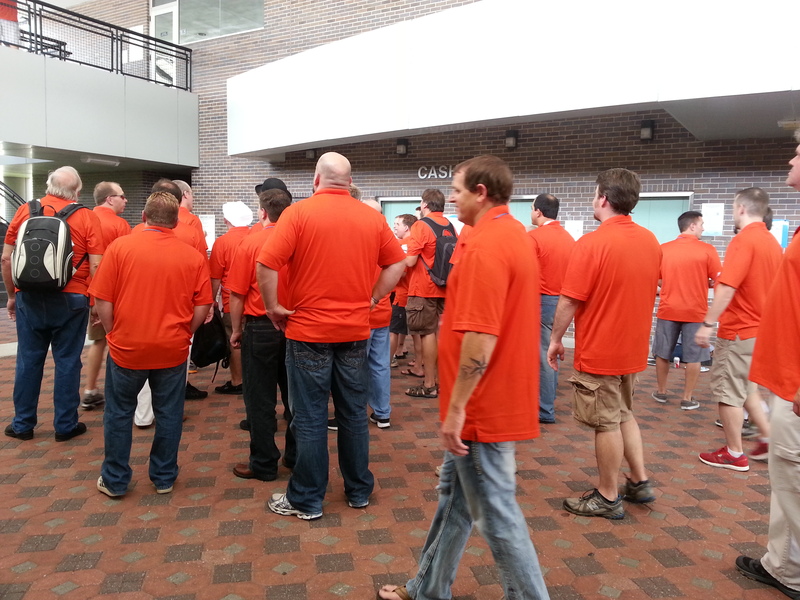 It was the first time my husband went with me to a SQLSaturday outside of my local one in Indianapolis. That one is a whole different ballgame since it’s one I organize and I put the whole family to work for me (evil slave-driver I know). SQLSaturdays and SQLFamily are important to me so I was determined to get him introduced to these events and folks he hears so much about all the time. We flew in on Friday. I was half tempted to come earlier for some of the fantastic precons going on but decided better not. We were already planning on staying a couple days afterward for some tourist fun. We made it in town with plenty of time to get to Karla’s (blog|twitter) house for the speaker dinner. 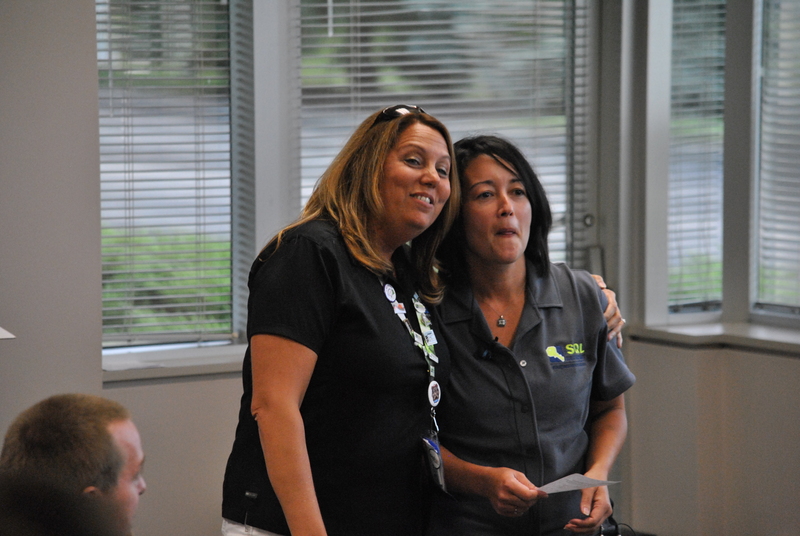 God bless her, she was the main organizer of this SQLSaturday AND was brave enough to have the party at her house! I love parties at houses, very intimate and laid back. No way I am that brave/crazy though. Look at all that orange! Next morning up early. Not early enough to catch the early bird sessions. They had some sessions that started at 7:30am! That was the first time I had seen sessions that early. I made it in time though to get situated before Jonathan Kehayias’s (blog|twitter) session. I was on a mission to meet him and catch his session since he’s often my reference of SQL knowledge (“well I’m no Jonathan Kehayias but…”). I accomplished both so was a happy camper. He had a packed room for extended events session. He showed some great stuff like how he finds the culprit of ASYNC_NETWORK_IO waits with them. 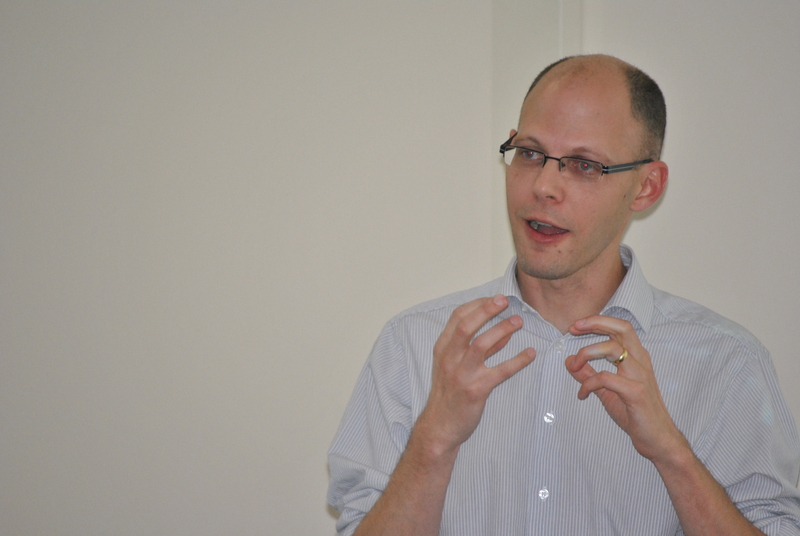 After his session was mine on spatial data. I was anxious to get a practice run of my upcoming PASS Summit session. It went amazingly well! I had a really engaged audience and many who stayed late to chat more and discuss things. I got some good feedback and some ideas to make session better for next time. I wanted to answer all questions I had after my session so I was late to my lunch duties. 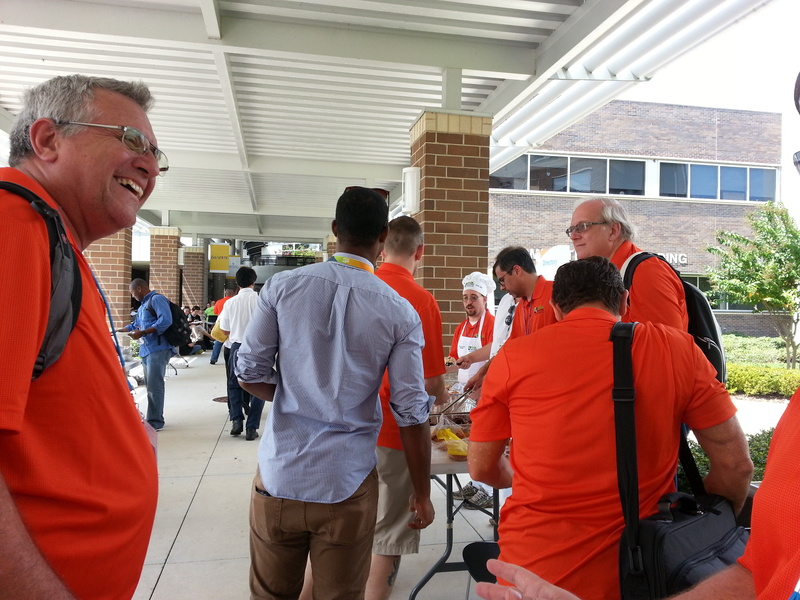 Andy Warren (blog|twitter) and the team in Orlando have a tradition of having the presenters help serve lunch which is a nice idea. The lead chef, Andy Warren. After lunch I went to Mike Davis’s (blog|twitter) session, “Complex DAX Functions”. 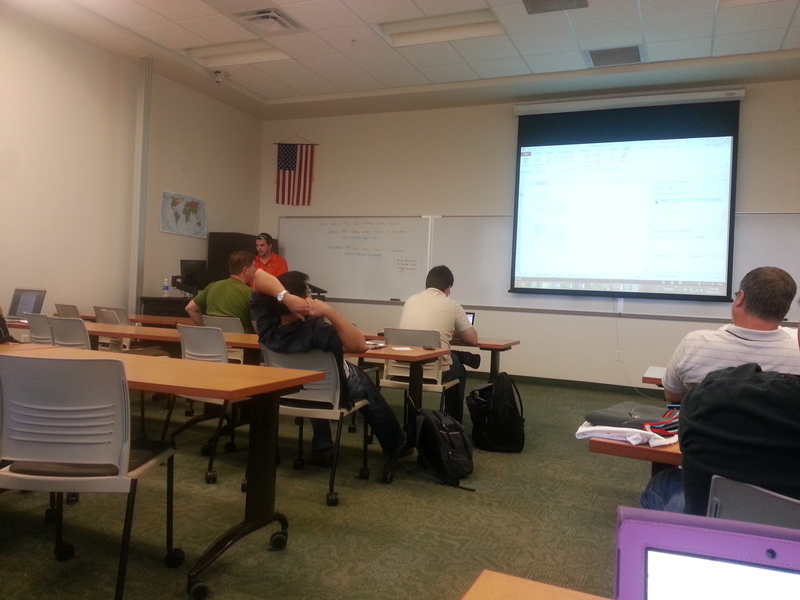 He ended up having a fairly new to PowerPivot audience so much of the beginning he had to go over basics. He did get to some of the advanced topics such as creating a many to many relationship. After that I went to meet Doug at the Confio booth. It was kind of a crazy crossing of my two worlds a couple weeks earlier. I found out one of my best friends from college had a brother who worked at Confio! From there it was on to Mike Hillwig’s (blog|twitter) session on VLFs. I had seen it before but well he’s just great so I went again. I was glad I did as saw a lot of his progress on the session from before. Nice job Mike, flow was much improved. The last session of the day was from Tim (blog|twitter) and Amy Ford (twitter) and their experience with telecommuting. I had been talking with BlueGranite for quite some time so I knew that telecommuting could be in my future. I was anxious to hear what I could be in for with working from home. I was lucky enough to get that job with BlueGranite, so have put some of them into action from the get go like having my own work space. 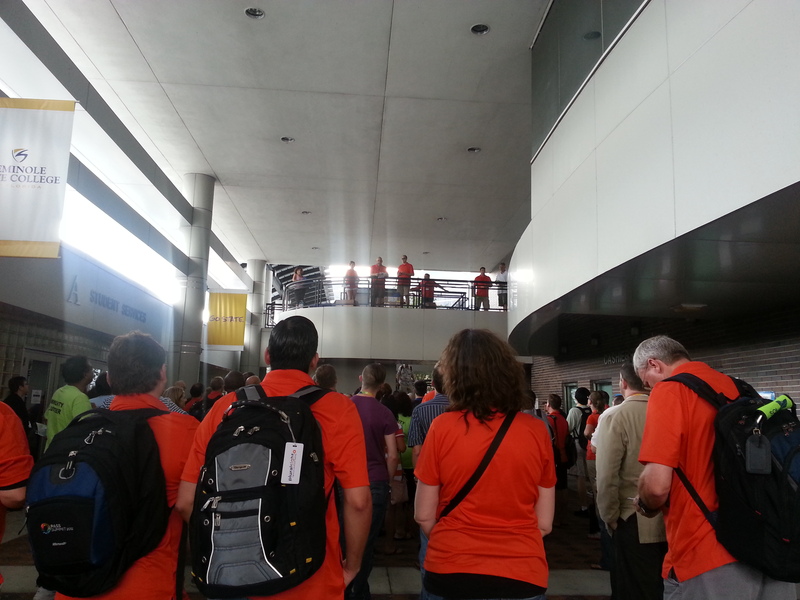 Next I witnessed the other tradition of Orlando SQLSaturdays which was the tossing of giveaways and swag from a decently high balcony. I forgot to ask Karla if they get extra liability insurance for this piece. The organizer in me was squeamish at this! Watch out now! Flying swag! The after party was held at 4th Street Bar and Grill where we had a nice outside section to ourselves. After some beer and lobster mac n cheese, Karla was crazy/brave again and invited folks to their house for the after after party. We had such a good time! The hubby couldn’t stop talking about playing those drums for days! Thank you to Karla/Rodney (blog|twitter) for the hospitality of your house both nights. Thanks to Karla and the entire Orlando team for a great event! So glad you all invited me to come speak! SQLSaturday 242 wasn’t attacked by AT-ATs, I just couldn’t resist the chance to use that title. Last year I cheesily went with “A New Hope” for my blog post title for all the lessons learned and how changed I was from the process. It’s not that often you have an opportunity for a Star Wars reference AND a shameless previous blog post plug wrapped into one so I had to do it – please forgive me. 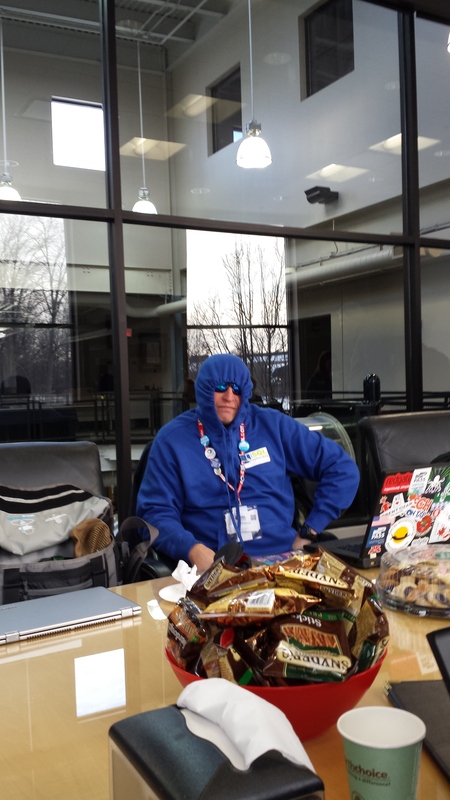 Besides it works if you consider I did feel a little like I was frozen in carbonite the day after SQLSaturday 242. 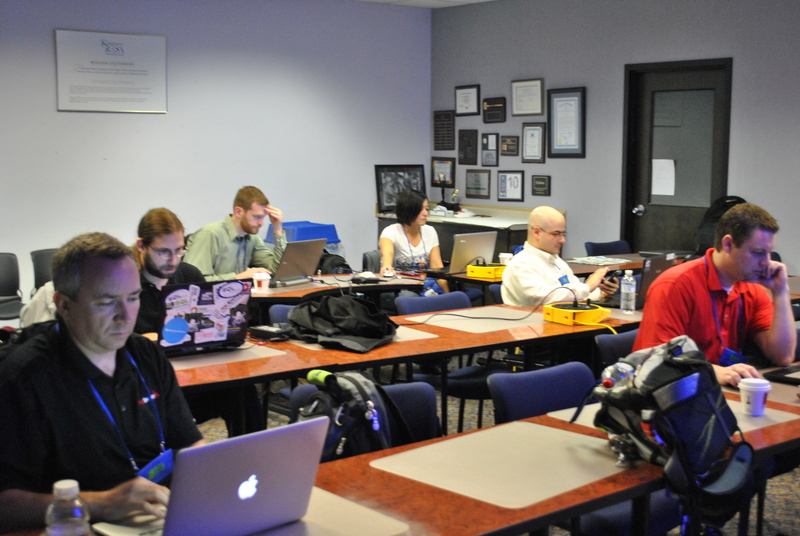 Alright now that I’ve got the Star Wars-ness out of my system, and I’ve had some time to recover it’s about time I got my blog post out from my experiences being the lead organizer of SQLSaturday 242. This year was much different than the last couple years. Those past years I was very involved and helped in organizing but had the wonderful Caroline leading the the way. This year I had to step out on my own and lead. Oye, I should have thanked Caroline more profusely in the past years! There was just so much she did that I wasn’t even aware. God bless ya Caroline! I was excited to do it though. I was anxious to right some wrongs that bothered me since last year (again see blog) and help pay forward to the SQL community some of the goodness that SQLSaturdays have brought to me over the years. When I started planning this year I was determined to find a new venue. The place we had been the past years was a great venue, just located in an area where it is scarce to find good hotels for my speakers. Since the hotel was the main thing sticking in my craw from last year, hell or high water was going to rectify it this year. And I found a great place in a great location with Indiana Wesleyan on the northside. They were great to work with and good hotels were plentiful. We didn’t even have any act of god storms or issues in the hotel. Demon exorcised – halleujah! Honestly too it is great relief that I REALLY TRULY know the full ins and outs of what this event takes to happen. There were so many unknowns I had going into this event having not sat in the lead spot that it drove me completely nuts. I would keep myself up at night just sitting and making list after list to try to think of everything I needed to do. I wanted with my hometown SQLSaturday more than anything to take care of my people: my speakers, my sponsors, my volunteers, my attendees. I want them all to just feel like we were taking care of them. Have you thanked a sponsor today? Friday comes and I got at it early so I could get Bill Pearson setup and going for his precon since PTI was hosting it. We had some hiccups with the projector software but Bill, being the pro he always is worked through the rough patches and we worked it out. Then I begin setting up the attendee packet stuffing station. As I looking the table of 1000 laps and a million sponsor flier papers, I started to get a bit panicked. I then called in the calvary…my saint of a mother in law, Pam who agreed to help out. Then when the blessed, wonderful Chris and Gigi Bell show up they help make fairly quick work of it. Alan Dykes also shows up and helps me with the monitor setup. 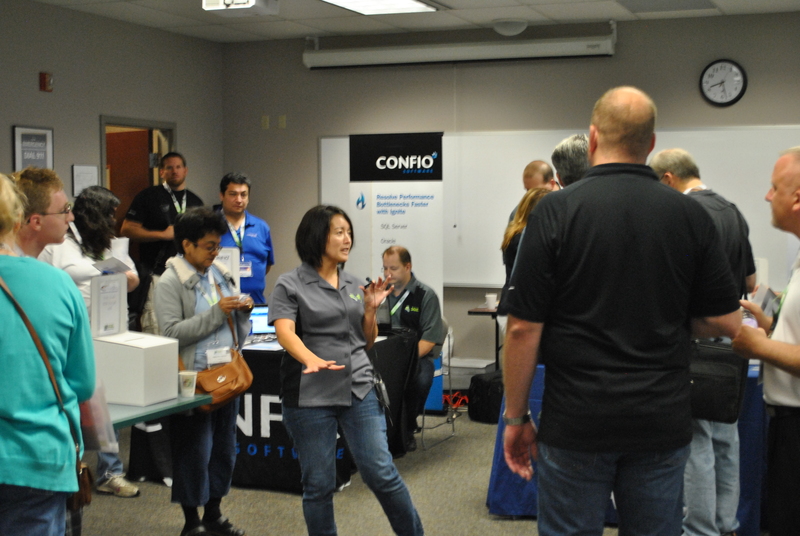 I had attended SharePoint Saturday and they had monitors outside the rooms to display the current and upcoming sessions. I thought it looked slick so we worked that out but it wouldn’t have happened if Alan hadn’t had stepped in to help with it. Later that night comes the speaker dinner. We ended up doing bowling again this year which was fun. It’s not fancy but is a great way to get folks loose and chatting. I think it went well and seems like all had a good time. I got some cupcakes to help butter folks up too just in case. I started to loosen up a bit and some of the weight begins coming off my shoulders since by that point, if it ain’t done it just wasn’t gonna happen. Then comes Saturday and we are up at the crack of dawn to get the mad dash going to get things setup. We weren’t able to get in till 7:00 and we had registration starting at 7:30 so it didn’t leave much time for things to fall into place. The morning was just nuts, it’s just the way it goes even if things run like clockwork with an event with that many people. I had to get the computer and printer setup for the SpeedPASS printing area of shame. Never fails, you will just have folks who don’t print SpeedPASSes no matter how many pleas you send. I bought a printer that we ended up raffling off at the end of the day which worked out really well. Just make sure if you stay up the night before getting the drivers and crap setup that you plug it in and do it in the same manner you intend to on go day. Damn thing installed drivers anyway since I plugged it in instead of using the wireless. As the morning moves on we run into more bumps. This was my first year also to administer the site for the event. It turned out I didn’t have some of the sponsors selected to be in the SpeedPASSes so I had to hurry up and make some raffle tickets really quick and get them printed them for folks to fill out (was able to scan SpeedPASSes off of computer for these sponsors after the event to help rectify this wrong). While I was doing super fast design work, I didn’t have time to think over what I needed to say for opening remarks. I think I may have sounded like a stressed out Elmer Fudd yammering thank you and that was about it. I meant to say more so folks were aware of little details. The rest of the day moves on and things start to settle down from morning craziness. We had some more minor hiccups that had us bobbing and weaving but we came out of it without much damage. Lunch came and went and things went as smooth as I think lunch for 191 people can go and it didn’t take terribly long to get folks through the line. We didn’t have a large area for people to eat so we needed to have folks disperse into the various rooms. Something I think I could have gotten across again in opening comments. Rest of day goes well and we were very lucky to have great sponsorship so were able to get a lot of great prizes to give away. We were needed to get out of the venue fairly quickly so we tried to move through them at a quick clip. Sometimes that portion can drag along if you let it. I let out a large sigh of relief and it was over. We cleaned up really quickly thanks to all the volunteers on deck. We then get a good size group headed out to Scotty’s Brewhouse for a much needed beer and some food. 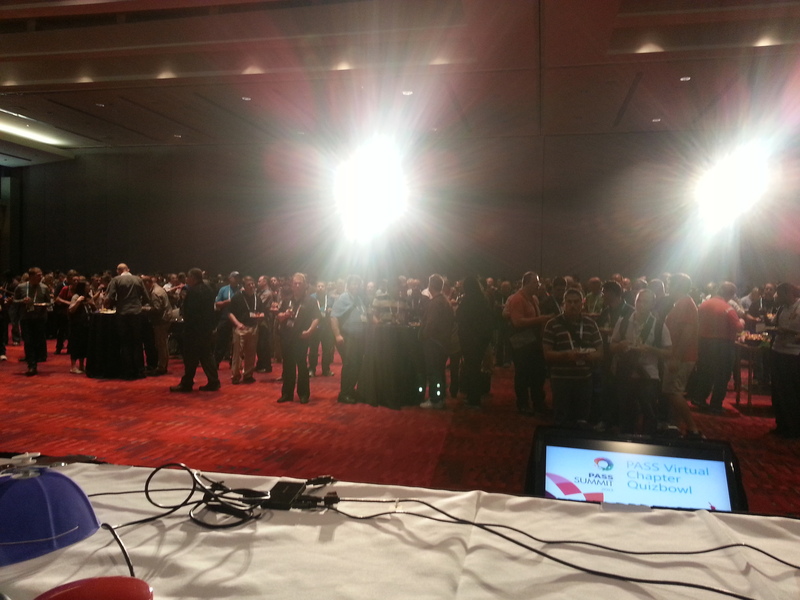 I got a bit misty eyed when I got a good amount of applause when I arrived (I love my SQL peeps). From there some found a Korean place that had private karaoke rooms so some brave souls headed over. We had a blast but it was a tad bit interesting/disturbing with the Korean dramas going on the screens while you (not me) sang. 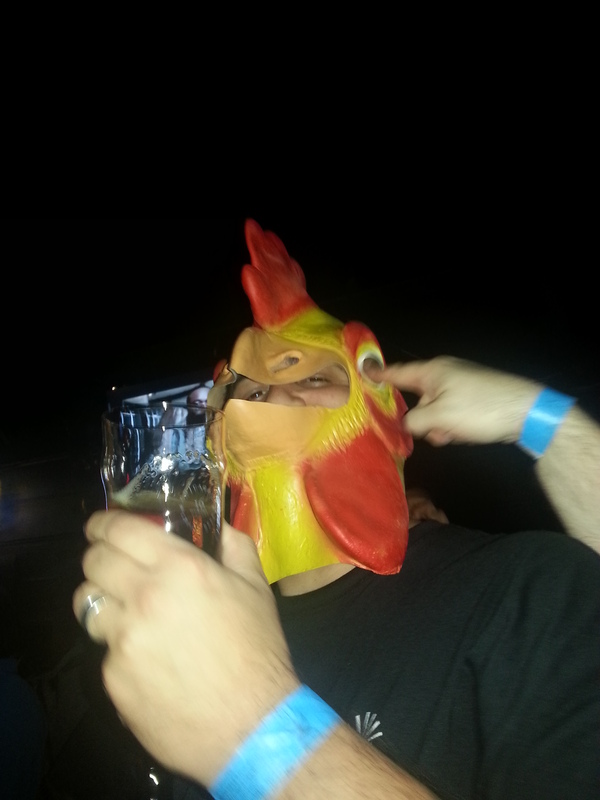 Who knew you could possibly add weirdness to SQLkaraoke but by god we did. This was needed desperately at the end of the day! 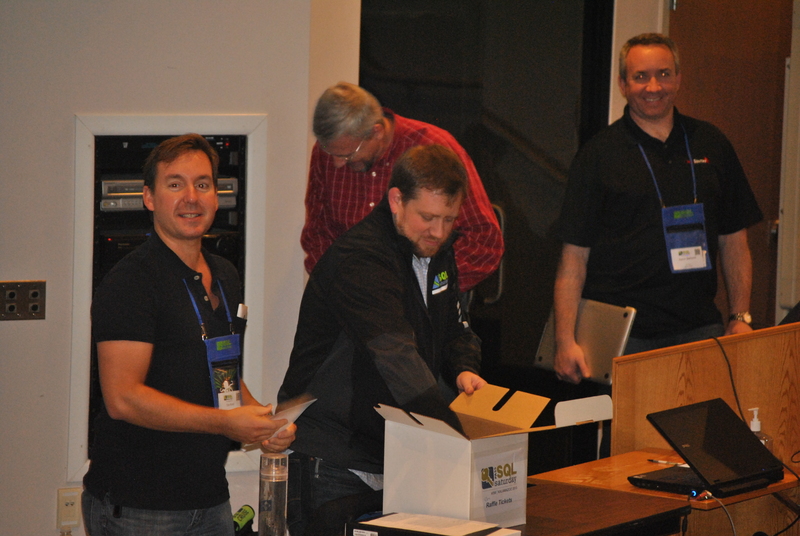 Thank you so much to everyone who helped me with SQLSaturday 242! Thank you so much to my family, Rod, the kids, and my saint of a mother in law Pam. You put up with my distraction, picked up my slack, and even helped with the event. I was so glad you all could be a part of one of these. It means a lot that you got to see a little glimpse into these crazy SQLSaturday things you hear so much about and got to see this side of my life. Thank you to Sally at PTI who helped me get so many things together and cut more paper than a human should! Thank you to everyone at PTI for helping me, allowing me the time and resources to organize this event. And thank you to Alan for your help all along the way and handling those damn monitors! And my registration crew: Gigi, Katie, Courtney, and Stephanie! You ladies just killed it at registration and all through the day! I can’t thank you all enough! Brandon Lukes thank you for your help! Thank you Eddie for handling the precons. And countless others who helped me, thank you! From every fiber of my being, thank you! It meant the world to me to have so many help make this event a success. 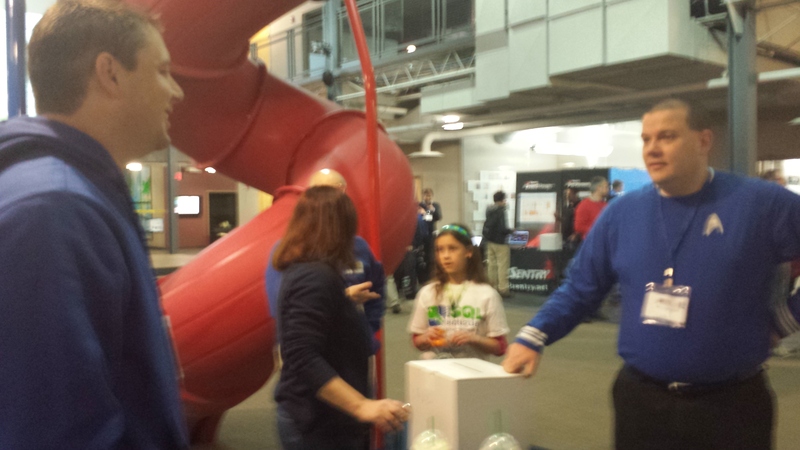 And since I am selfish and figure I need all the good SQLSaturday karma I can get, here are some recapped lessons and a few more thoughts on SQLSaturday 242 Indy. 1. Make sure you keep a good list of sponsors and the raffle prizes they intend to give away. You need to keep good track of the ones they are bringing themselves and those they give to you, the organizer. Then PRIOR to sending out word on the SpeedPASS check to make sure all who intend to give prizes are included in the SpeedPASS. The system will only auto print for silver and above sponsorship levels. Double check since bronze/swag sponsors sometimes have giveaway prizes but are not selected by default. 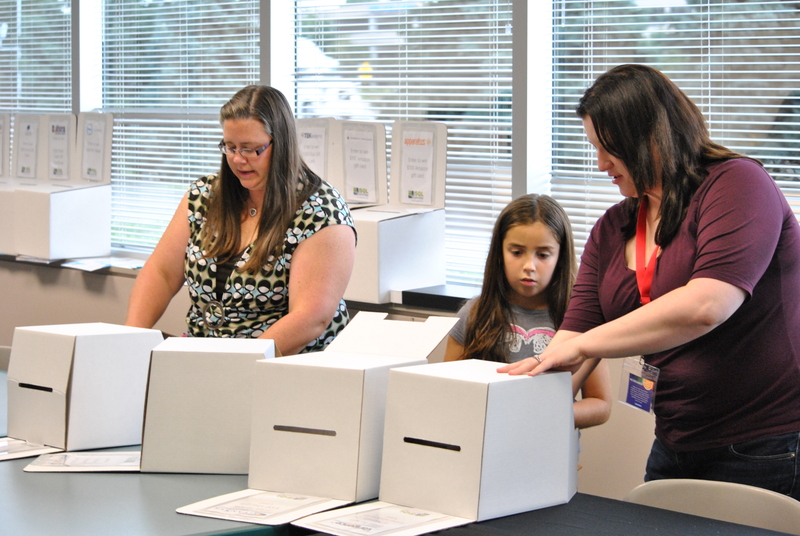 Make sure that you have good details on how attendees will need to claim prizes prior to the event. Print out certificates if necessary just to help you keep track and have something easy to hand over to winner. 2. Make sure if you intend to have speakers give away books to get them the details on what they need to do. Sorry speakers. 3. Make sure to be prepared before the morning comes with different items that should be addressed during the opening comments and PRINT it out. I had a OneNote list that I assumed would have time to review before it was time to speak. Yeah that assumption was wrong. 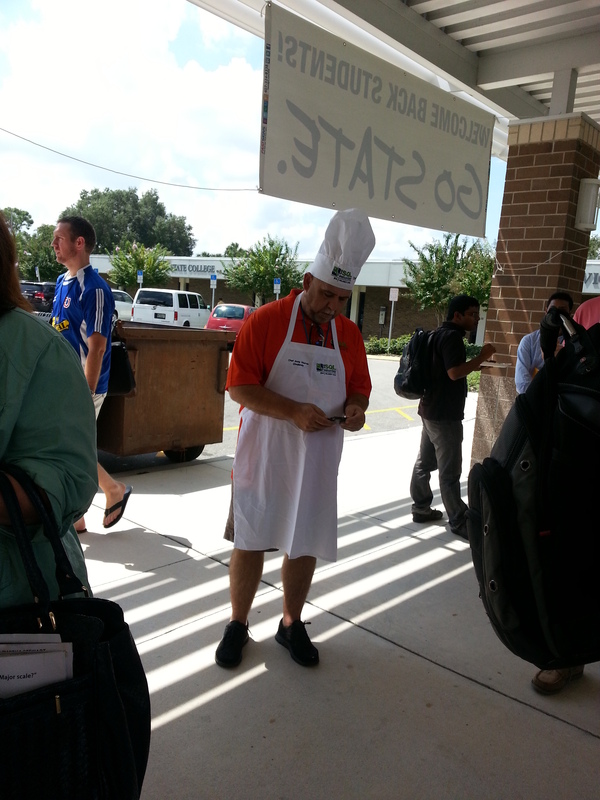 Make sure to get information on logistics throughout the day such as plans for lunch. Also make sure to give an overview of what SQLSaturday is and that it is a mix of experienced speakers as well an opportunity to encourage new speakers. We had some comments to the effect that we should “vet speakers as some were inexperienced”. 4. Make sure to check with businesses and city ordinances that it is ok to put up your SQLSaturday directional signs. I had 5 signs of which I got back 1. Maybe it was hoodlum Oracle teenagers or something but our signs went missing. I love it when the signs are up when I go to a SQLSaturday. Sorry to those who came later when they were gone. 5. Get the session levels on the printed schedule. We had some really nice clear envelopes for sponsor swag and the schedule. On one side we had a nice color, printed schedule that was visible through the envelope that I think was very handy for attendees. I did not have the session level on it though which would have been helpful. Also would like next year to get colors for tracks on it as well. 6. Make sure to have some committed help to stuff packets. Just a few hands can make all the difference. 7. Check very early on the catering situation of any potential venues. Many venues will have exclusive contracts with caterers which means extra $$. This can be a huge expense that your $10 charge for lunch won’t cover. Also make sure you account for the cost of speakers and sponsors to eat. Make sure you know how much money you may need to cover the costs before you sign up for the venue. 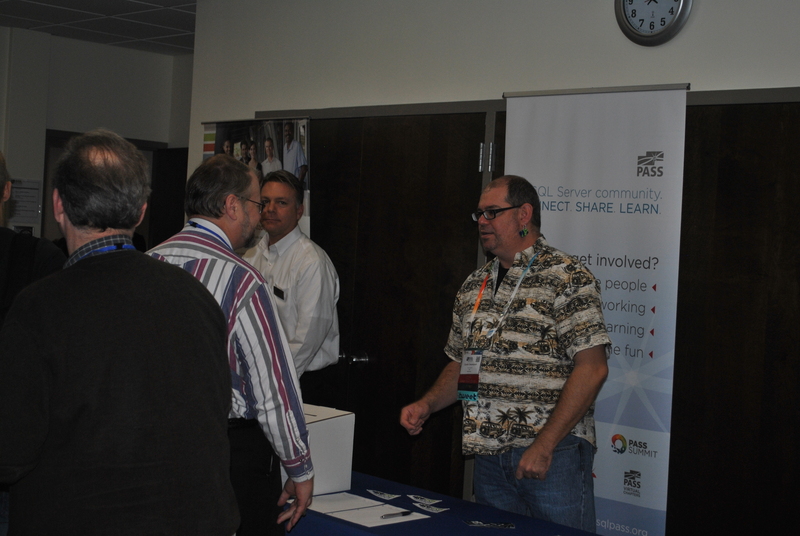 We didn’t have any issues with that but just could see that helping potential SQLSaturday organizers. 8. If you need printers, monitors or other items during the day see if it makes sense to buy those items to raffle off at the end of the day for prizes. 9. Make sure to have coffee setup for the entire day. We had several folks wanting for coffee in the afternoon. 10. Make sure you have some food items at breakfast that do not contain nuts. We had coffee cakes but I didn’t realize they had nuts and didn’t even consider those with allergies. Karla embarrassing me giving me props at the end of the day. 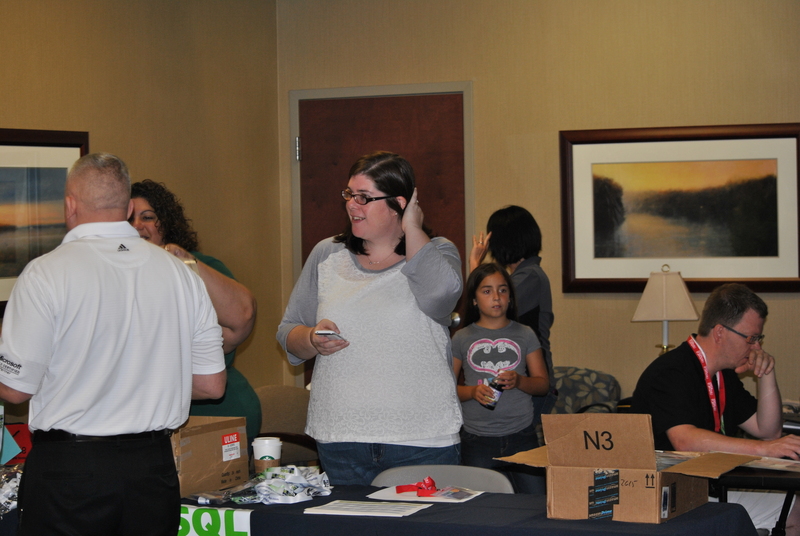 So I survived organizing a SQLSaturday again and feel like I came out of this one with less battle wounds. It was a lot of work but there really is a great feeling of accomplishment at the end of the day. 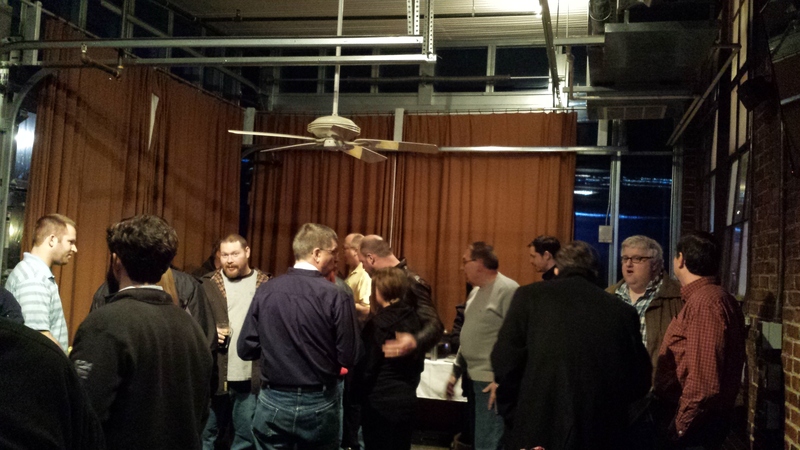 I helped bring some more SQL community to Indy and THAT is a great thing.